Some might consider Burke's choice of an album cover as a focus of analysis a curious one. Certainly, in aesthetic terms, the album cover probably doesn't compare to some of the great works of cultural history we might discover in the Snite Museum. Does that matter? How does Burke legitimize his analysis? What questions does he ask of the album art? What contexts does he consider it through? The essay seems at once interested in making an analytical argument about the way Kanye West uses his cover art to present himself in a certain fashion, and in making an evaluative argument about West as a musician. How does the essay navigate these two terrains? Are they distinct from each other, or do they overlap? What seems to be the essay's primary argument, and does the other aid the author in reaching that point? Burke's paragraphs are, admittedly, on the longer side, certainly longer than we might conventionally recommend (say, around five to eight sentences). Do his more robust paragraphs work? If so, why? If not, where might he cut? How does he maintain clarity of expression? Or does he? Like any number of its artistic counterparts, music has been shaped by a wide-reaching and intricate history of change. The genre of hip-hop alone has made groundbreaking strides since its birth in the early 1970s, an evolutionary leap which took the strong will, audacity, and pioneering vision of a number of artists over time. Undoubtedly one of the most important of such trailblazers is Kanye West, who in 2004 released his first of a string of records, which, over time, would come to break new ground in the music world. His third studio album, Graduation, was particularly avant-garde for its time, and its revolutionary sound was evidence of West's confident and exclamatory movement to evolve the genre. His chosen cover art for the record both built on and backed that sentiment; its vibrant, futuristic visual palette, incorporation of educational symbolism, and eclectic use of imageries centered around the journey and stature of the subjective "Dropout Bear" reflect a number of West's triumphant, unheard-of musical divergences into new sonic and lyrical content. At the same time, the prideful and imperious state of the "Dropout Bear" illustrates Kanye's boastful self-aggrandizement, making clear that, in his eyes, Graduation elevated him into the position of the world's top artist, with an unprecedented confidence and swagger that made his status unquestionable. Some of the most notable aspects of the album artwork are its flattened dimensional aesthetic and its brilliant, almost gaudy multicolor scheme, both purposefully obscure deviations from West's previous album cover designs which reflect the album's new, distinguished anthemic sound. Though each of the covers of West's first two studio albums—The College Dropout (2004) and Late Registration (2005)—also feature the same central character referred to as the "Dropout Bear," the cover art of Graduation has a wildly different artistic approach. The cover of his debut presents an elegantly bordered photograph of West himself dressed as the Dropout Bear, with a simple gold-brown color arrangement. Late's cover is largely overcast by darkness and has little color at all. Though animated, it too has a clear three-dimensional ambience actually developed from a picture. This intimate yet plain, modest visual artistry is illustrative of the more conventional lyrical structures and soul-influenced production these albums feature. Graduation, on the other hand, dives boldly in a new stylistic direction. After spending the past year touring the world with Irish rock band U2, West became infatuated with the aspect of creating a "stadium sound" for his music. The energy of their performances and the ovations they would receive inspired him, for his new album, to shift his focus to making anthems—tracks with booming, spacious melodies that would thrive in an arena setting. The striking contrasts in the texture and color of the Graduation cover, as compared to its two predecessors, are reflective of this new approach. It is as electrifying visually as an arena rock performance is sonically, commanding attention with its eye-popping flurry of color. Its abnormal dimensional feel has a similar effect, elevating the grandeur of the display by seemingly attempting to crowd all of the cover's features into the foreground, almost "pressing" the image into the viewer's face in a way that gives it a stadium-like energy and intensity. The musical differences speak for themselves upon listening, but the album cover subtly captures these changes with its color and textural distinctions. One of the ways in which West signals his musical innovation in the cover is through a visual appeal to the exotic and foreign, which is artistically—just as his more personal lyricism is musically—obscure to conventional tastes of the time period and thus new. To design the artwork, West enlisted surrealistic Japanese visual artist Takashi Murakami, whose involvement ensured from the start that its creative vision was to come from an entirely different world than that of its antecedents. That sentiment held true in the result: an anime-inspired agglomeration of assorted pastels based in the framework of "superflat," a postmodern art movement founded by Murakami himself. This technique gives rise to the two-dimensional feel of the image. Combined with its sporadic use of multicolor, it contributes massively to an aura of an exoticism which, as a whole, gives the image a very off-base feel. In comparison to contemporary album covers especially, it looks considerably out of the ordinary. This is a feeling that resonates in the album's musical content; thematically, Graduation is unlike anything West had created in the past or that the rap industry had ever been exposed to. Throughout the early and mid-2000s, hip-hop's biggest stars were influenced mainly by gangsta rap. The era was dominated by hard-hitting club tracks whose lyrics tended to emphasize crime, violence, misogyny, drug abuse, and gang-related activity. West's lyrics on Graduation, however, are largely introspective in nature, touching on individual perspective and much more personal subject matter in what West himself called an attempt to create "people's theme songs." West alludes to this nonstandard thematic content by making use of Murakami's equally unusual visual content in the album cover. The tracks also feature unpredictable influences and sampling from numerous musical genres, a quality paralleled in the cover art by the diverse and chaotic usage of color. 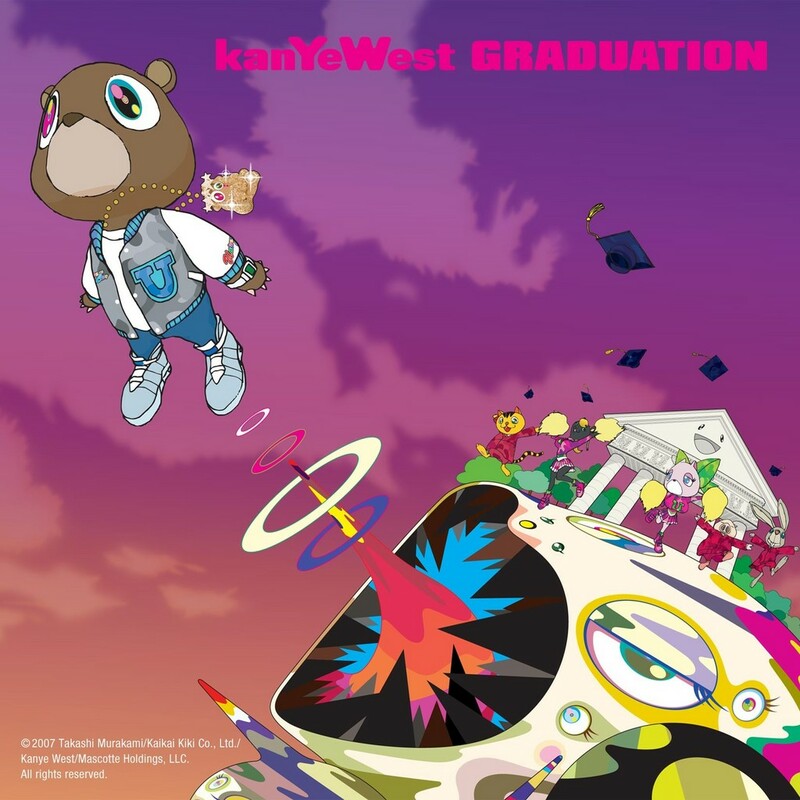 West was undoubtedly self-aware of the novelty of his sound and the atypical themes of his lyricism, and with the help of Murakami, makes reference to them with the similarly novel and unfamiliar design of Graduation's cover art. Aside from its artistic methods, the modernistic content and otherworldly setting of the cover are telling of the album's obscure, varying musical influences and striking digitally-manipulated and electronic flavor, which are applied so heavily and in ways so untested by other musicians as to sound otherworldly in their own musical sense. The story of the "Dropout Bear" ultimately lands him at the ceremony for his college graduation from a university cleverly dubbed "Universe City." Fittingly, the school appears to be located somewhere in the sky, perhaps even in an interpretive version of outer space. Large, cloudlike figures mistily crowd a hazy backdrop which, as it ascends, darkens from an orange-pink hue to a deep purple. The ceremony itself, somewhat distant in the background, takes place on the surface of a practically indescribable structure whose only conceivable resemblance is the moon. Roughly spherical—aside from the gaping hole of a cannon in its side, blasting Dropout Bear into the atmosphere—the edifice is slightly tilted, its occupants seeming to defy gravity as they stand straight and undisturbed in their celebration. Their graduation caps fly far above their heads, some barely visible as they fall away into the distance. The aforementioned cannon is another peculiar aspect of the scene, and contributes equally to its futuristic semblance. At the center of its mouth, an explosion of fluid color rises into something of a laser, from the end of which Dropout Bear soars, leaving a trail of colored rings in his wake. Like a page out of a sci-fi graphic novel, the artwork is the essence of otherworldliness—a realm strange and unfamiliar, yet far ahead of its time. Just as this eclectic, ethereal subject matter serves as something of a window into a cosmic and technologically advanced future, a great deal of the production on the album is in fact, in the context of mid-to-late 2000s hip-hop, otherworldly. It bears heavy elemental relations to electronic music, house, and arena rock—none of which West was the inventor, but his incorporation of these components into the context of a hip-hop record was truly unique at this point in time. Densely layered, sometimes blaring synthesizers and a bevy of obscure, distorted audio effects, normally overbearing, are delivered crisply and precisely, coming together to form a complex yet sophisticated soundscape—the audial equivalent of the atmosphere in which "Universe City" exists. West, like his anthropomorphic mascot, fires himself up into space on this record, largely abandoning tradition and diving confidently into unmarked musical territory. The state of Dropout Bear, however, makes reference to much more than just the sound of the album; his tale and his educational involvement are also symbolic of West's stark independence and self-assuredly progressive mindset regarding his advancement in the music industry. As previously mentioned, the cover of Graduation finds Dropout at his own graduation ceremony with his fellow classmates. In actuality, however, he is hardly "at" the ceremony nor is he truly "with" his classmates. Instead, he flies above and away from them, propelled by the cannon in the opposite direction of their celebration. Yet of course, he is the clear focus of the image, dominating the foreground and appearing exponentially larger than his animal companions. Without a doubt, this is a metaphor for West's own perspective of his place in the music world, Dropout Bear an obvious representation of himself and the rest of the "graduates" emblems of other contemporary artists. Having Dropout Bear flying far above them, West emphasizes both his artistic innovation and his progressivism, setting himself not just apart, but above his contemporaries. Meanwhile, West uses Dropout Bear's clothing and visible disposition to present himself as an entirely different breed, pushing the envelope and evolving in ways nowhere on the radar of other musicians, without any concern or appreciation for their so-called success. That attitude is evident in Dropout Bear's posture. He assumes an almost superhero-like pose as he elevates, wide-eyed and composed, looking only up at the path ahead of him. There is an air of uncertainty in that path as well; the darkening sky into which he rises seems to resemble a sunset. But Dropout is undeterred, much as West—taking a great artistic risk with this album—is unafraid, and in fact determined to define a new brand of musical exploration. What is more is that, despite the size of that risk, he takes it with such a self-assured sense of confidence and nonchalance, further evinced on the album cover by Dropout Bear's attire. While his classmates wear matching, typical graduation gowns, Dropout dons a plain white tee underneath a varsity jacket, complete with high-top sneakers, a watch, and an oversized, shimmering pendant suspended from a gold chain. As clichéd of a description as it is, the bear is quite literally "too cool for school." He subtly scoffs at the formal, celebratory dress of the others in favor of a much more stylish and expressive wardrobe. Unquestionably, West views himself in that same light. With Graduation, he was poised—and ever-so-confident in his ability—to solidify his place at the top, far above all others. And almost as if to slight them, he refused to beat them at their own game. He instead moved entirely out of their league to create a singular, incomparable masterpiece in Graduation, the musical embodiment of breaking from the pack. The rapper's vision is defiant, innovative, and dauntless, coming through with a flair and braggadocio perfectly captured in the album's cover. As it would turn out, the final installment of the Dropout Bear trilogy was only the beginning for West. Throughout his career, and still today, he continues to make a name for himself as both a musical vanguard and a cocky, collected trendsetter. The argument that Graduation marked the birth of that persona, however, is certainly grounded, and its cover art suggests as much. Its educational themes make direct reference to West's own "graduation," a one-of-a-kind progression which stretched the boundaries of hip-hop's musical scope and left his contemporaries in the rearview mirror. The artistic tools of which it makes use—its cartoonish, flattened dimensions and incorporation of practically every color in the rainbow—speak even further to the advanced, exotic, and diversified sound of the album's music. West's forward thinking sparked an irrefutable influence on the music industry, the impact of which continues to shape artists and records to this day. Teddy Burke is a member of the class of 2021 and originally from Darien, Connecticut. His essay, "The 'Valedictorian,'" provides a visual analysis of the cover art for Graduation, the third studio album of rapper, singer-songwriter, and producer Kanye West. Specifically, it breaks down the ways in which the artistic techniques, nuances, and content of the artwork allude to the progression of West's career and the distinguished, groundbreaking elements of the album's music itself. A longtime fan of West's work, Burke was inspired to write this essay by the chance to speak on some of the artist's most compelling musical accomplishments in an analytical sense. At Notre Dame, he intends to major in Finance, with hopes of pursuing a career in business. He would like to thank all of his English teachers from Regis High School, especially Justin Kiczek, for helping him to learn and develop as a writer, as well as his 2017 Writing & Rhetoric professor Nathaniel Myers for his invaluable advice both on this essay in particular and in guiding him to polish his overall writing craft. Barthel, Mike. "Understanding Kanye: Sweet, Sweet Robot Fantasy, Baby." The Awl, 15 Nov. 2010, www.theawl.com/2010/11/understanding-kanye-sweet-sweet-robot-fantasy-baby/. Reid, Shaheem. "Kanye's Graduation: Inside The NYC Listening Party For West's So-Called 'Comeback'." MTV News, 29 Aug. 2007, www.mtv.com/news/1568459/kanyes-graduation-inside-the-nyc-listening-party-for-wests-so-called-comeback/.